The gigantic mass of this cluster creates the fascinating phenomenon of strong gravitational lensing. The gravity of the cluster bends light coming from behind it in a similar way to how the base of a wine glass bends light. The effects of this lensing can be clearly seen as curved streaks forming a circular shape around the center of the frame. Astronomers can use these distorted galaxies to calculate the mass of the cluster—including the mass of the dark matter within it—and to peer deeper into the universe than otherwise possible. Gravitational lensing not only distorts the views of galaxies, it also enlarges their appearance in the sky and magnifies their light. Hubble has viewed gravitational lensing many times and produced truly stunning images. 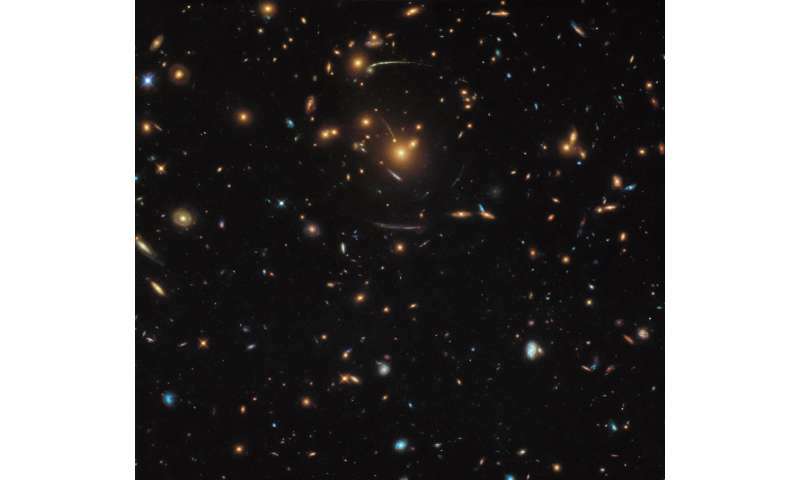 Astronomers even set up a dedicated program called Frontier Fields to study different galaxy clusters that show a great number of lensed galaxies. Some of the most distant galaxies in the universe were found this way. With each additional cluster observed, more distant galaxies are added to this list, slowly completing our picture of how galaxies looked and evolved in the early universe.